Anyone who has seen Cecil B. DeMille’s blockbuster The Ten Commandments will recall the raid on the temple granaries by overworked and underfed Hebrew slaves laboring to construct a treasure city to honor Pharaoh Sethi. They fill their baskets with grain, and, once well-fed, return to work. Like most stories set in biblical times, the temporal and factual accuracy of the incident is questionable, but this fictional depiction of the act carried out by the starving slaves demonstrates an ancient form of nonviolent protest against an exploitative and dictatorial system. An incident similar to the one depicted in the movie actually occurred. In 1170 B.C., disgruntled Egyptian laborers went on strike to protest insufficient food rations. These details were discovered and recorded by Kelly Schoolmeester ’10 and deposited in the College’s Global Nonviolent Action Database (GNAD), a one-of-a-kind research tool that allows scholars from around the world to browse scrupulously detailed examples of peaceful protests of all kinds. The Egyptian strike—the first labor strike in documented history—is recorded on papyrus. It occurred in the 29th year of the reign of Pharaoh Ramses III, when the builders of the royal necropolis dropped their tools and walked off the job because they were not being fed. The strike was successful; the workers received their rations; and, learning that peaceful strikes succeed, they went on to strike again. Schoolmeester, who worked on GNAD in its early days, is one of dozens of students who have painstakingly researched and documented cases of successful peaceful protest, which now populate GNAD. Visiting Professor of Peace and Conflict Studies George Lakey, a research fellow of the Lang Center for Civic and Social Responsibility, initiated the project to “make available to people around the world hundreds of cases of nonviolent action to learn from and be inspired by,” he says. 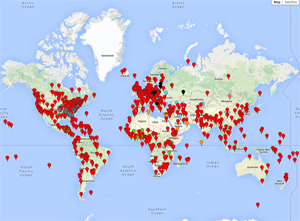 A world map, accessible on the database, identifies hundreds of cases of nonviolent activism worldwide. In 2008, Lakey began to gather cases for GNAD, recruiting students to help him. Like Schoolmeester, M Schlotterbeck ’10 was one of Lakey’s first research assistants, remaining with the project until graduation, writing up and formatting cases, and exploring viable research areas. “After the first year, we had about 50 cases,” says Schlotterbeck. At this time, Lakey started a seminar within the peace and conflict studies program, in which students researched and wrote up the cases that Lakey and his student assistants had discovered. Schlotterbeck later received a Eugene M. Lang Summer Initiative Award to fund the continuation of her work, and as a senior was a teaching assistant for the seminar, helping students uncover cases and format them. GNAD went live in 2011. 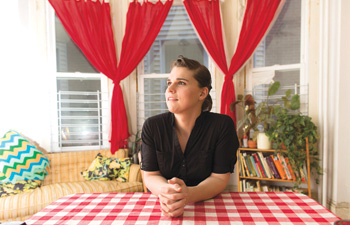 Schlotterbeck, now living in West Philadelphia and working for a food co-op, uses GNAD to reference cases to support her own activism with Decarcerate Pennsylvania, an organization that aims to end the building of new prisons in the state, reduce the prison population, and reinvest money in education and re-entry programs. 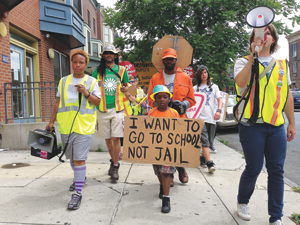 In June, Decarcerate members marched from Philadelphia to Harrisburg to demand reductions in prison budgets. “I’d written cases [for GNAD] about long marches that people had engaged in all over the world as a form of peaceful protest, so I knew that this was a tactic used everywhere,” she says. “I knew of the pros and cons of protest marches, so I could bring cases and insights into play as we planned this 100-mile march with a whole lot of people involved. Zein Nakhoda ’12 was another intrepid researcher for GNAD. He discovered and compiled 25 cases on peaceful protest. In 2012, Nakhoda produced a documentary film on GNAD, which screened at Arcadia University’s Engaging Peace Conference. He also joined other students and faculty members on the GNAD Advisory Committee. Adriana Popa ’12, an honors political science student who took Lakey’s class her sophomore year, also became committed to the project, despite initial doubts. She believed that peaceful protest in her native country, Romania, was nonexistent until Lakey urged her to investigate, leading her to discover a 2009 nationwide strike against government austerity measures. “That discovery reminded me of how myopic my view of my country’s struggles had been over the years,” she says. Swarthmore students aren’t the sole contribututors to the database. Students from Tufts, Georgetown, and Kennesaw State universities as well as Canadian institutions, including Menno Simons College Winnipeg, and Canadian Mennonite University, have submitted cases. Because the database is globally available, every completed case counts as a student publication. The database now holds 800 documented cases of nonviolent actions from 190 of the 192 countries in the world and receives an average of 1,000 unique visitors a day from those 190 countries. Only Monaco and Vatican City are not represented. A nonviolent action case map marking in red the locations of documented peaceful campaigns around the world leaves only little of the inhabited world uncovered. 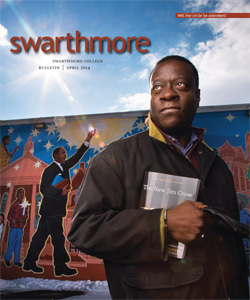 To browse the database, visit nvdatabase.swarthmore.edu. Great job M, we are proud of your great work.